On Thursday, the 28th of March, 2019, a Federal High Court in Abuja under the jurisdiction of Justice Binta Nyako issued a bench warrant order for the re-arrest of the leader of the Indigenous People of Biafra, Mazi Nnamdi Kanu, following his continuous absence from court proceedings. 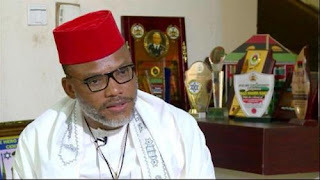 This is as the judge presiding over Kanu and the Nigerian government’s case has failed at every point to entertain any application filed by the former’s defense lawyer, Ifeanyi Ejiofor, detailing the circumstances surrounding his non-appearance in court, but proceeded to revoke his bail without accepting these applications. It is no longer news as every single media outlet in Nigeria jumped on it. Different headlines were explored by different journalists. The headline: “Kanu’s Bail Revoked,” kept reverberating and resonating in social media. This news was decorated to the understanding of an English language illiterate in the various streets in Nigeria. Due to the effectiveness of the news dissemination, people rumoured that the Biafran leader has been arrested during an evening broadcast on the day the verdict was passed. This was because his radio broadcast was interrupted due to some technical issues. It was a potent issue that everyone who came across it bought into, though some reasonable ones questioned its possibility. In line with the headlines running concurrently is that the International Criminal Police Organization (INTERPOL) has been contacted by the Nigerian government to take immediate action on the court order. This particular news raised eyebrows. Due to this eloquent headline, many Nigerian citizens were awake that night waiting to hear that the Biafran leader has been arrested and is now in Nigeria’s custody. People waited in vain. Till this very moment, there is no trace of the Biafran leader anywhere in Nigeria. The most comical one is the rumor that the Federal government is training soldiers to effect the arrest of Mazi Nnamdi Kanu in Israel. This headline was immediately faulted and dismissed by the people as fake. It couldn’t last one night for the reason that the Nigerian citizens know the strength of their soldiers which is nowhere near that of the soldiers of the Israeli government and the boundaries they are not supposed to cross. In conclusion, both the verdict passed by the corrupt judge who is now in the international spotlight and the headlines are all noise making – they hold no water. In a nutshell, they are futile and empty threats from a devastated country. This goes to show the reason why the Nigerian citizens are easily manipulated because they don’t follow or value records. If they do, they would have known by now that their government cannot go against Israel in any issue of sort because countries that have tried that in the past paid a big price for it.